Waku Waku +NYC Japanese Anime Con in Brooklyn NYC! 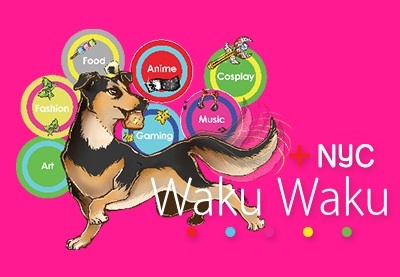 Saturday, August 29 and Sunday, August 30 from 10:00 a.m. until 10:00 p.m.
What is Waku Waku? A Japanese expression for excitement and the name of a new Japanese pop culture festival launching in Brooklyn on August 29 and 30. A celebration of anime, manga, music, food, film, fashion, and more, Waku Waku +NYC features guests from Japan, interactive exhibits, workshops, exclusives, and premieres. Waku Waku +NYC encourages creativity and wants all attendees to feel “waku waku”! Where is Waku Waku? Waku Waku +NYC’s HQ is in the brand new Brooklyn Expo Center with special events spread over Brooklyn’s Greenpoint and Williamsburg neighborhoods. Just a short hop from Manhattan by subway or water taxi, Waku Waku +NYC combines Cool Japan with New York’s coolest borough. Be Waku Waku! Tickets to Waku Waku +NYC give you access to exhibits, panels, screenings, and signings in the Brooklyn Expo Center and across Brooklyn. Be a VIP! Waku Waku +NYC offers a limited number of VIP tickets – including a separate entrance to the Brooklyn Expo Center, a fast pass you can use to guarantee spots in up to six panels and signings, an official Waku Waku poster and T-Shirt, and more. For a complete and to purchase tickets, please visit Waku Waku’s website.